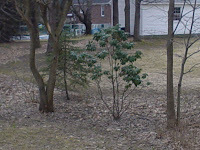 Here is a view of the woodland garden behind my house that I have been working to create over the past five years. 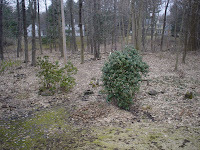 The Pieris japonica and the Rhododendron maximum (rose bay) were already here, although they are much larger now than at first. 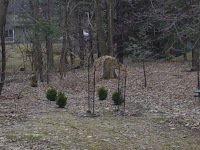 I installed the arbor and planted the Buxus (boxwood) and the other large R. maximum I transplanted last fall from another part of the yard. All seem to be in good shape after the rather long and harsh winter of 2008-09. There are also some wonderful azaleas and some other great shrubs out there as well as perennials that like a part shade woodland environment. 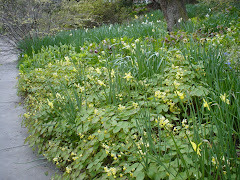 As the season progresses, I will post more photos so we can all see how well things are growing in my woodland garden.